This is the case of a 16 yr old boy who met with an accident leading to a traumatic head injury in August 2011. He was in a coma for 1 month after which he gradually started showing improvement. I started treating him in January 2011. He had suffered a diffuse axonal injury due to which both the sides of his body were involved. Initially he was hypotonic on both sides and trunk . He could move his left side voluntary control grade III in upper and lower limb but no control on right side. Within next 2 months he started sitting without support, supine to sit with support and required minimum to moderate assistance for sit to stand from high bed. He could stand with weight bearing on both legs with moderate assistance. His left side improved up to grade VI. His tone in trunk & RT upper & lower limb started improving (grade II). 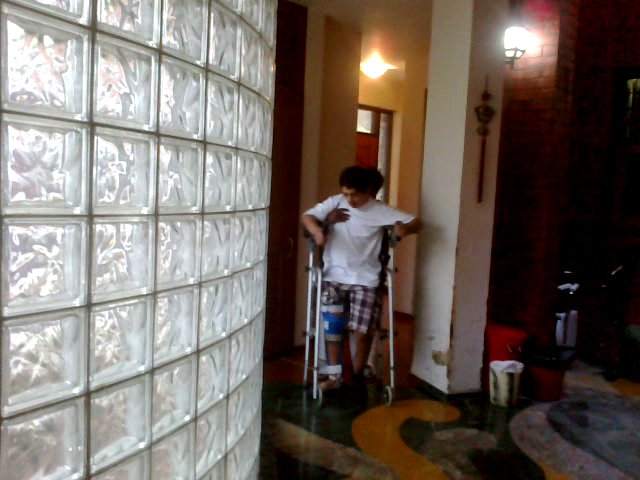 In March and April 2012 he was showing a picture of RT hemiplegia with grade II in UL & LL with developing spasticity. 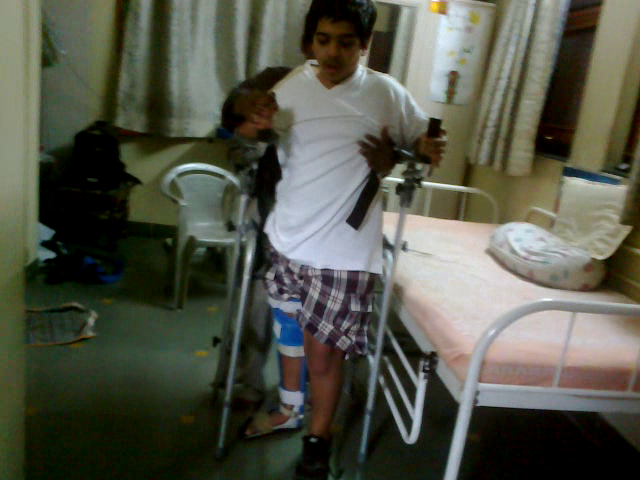 We used to make him walk with FRO and push knee brace on Rt (hemiplegic side). Initially with back forearm support walker then without walker. Assisted walking training was started ( we have to passively step forward the hemiplegic leg ). He could move the limb in supine but could not take a step forward while walking on ground. So we have decided to take him for hydrotherapy to improve his control of lower limb and active walking. Taking a Patient to hydrotherapy was a good idea but we do not have hydrotherapy centre/ swimming pool for patients in Pune (Except in Aditya Birla hospital). 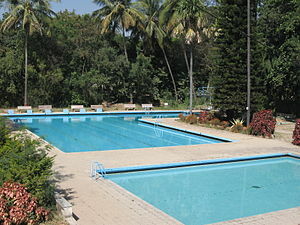 So we contacted one of the commercial pool in Kalyaninagar. We explained them the condition of the patient & our objective. Then they gave us the permission. They have given us two lifeguards to help us during training session in the pool. 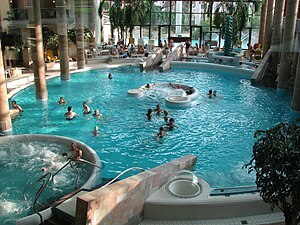 We were alloted a time of 7 pm to 8pm as the pool was occupied at other times. So, the patients had to adjust accordingly as they were not allowed to come along with regular batches. 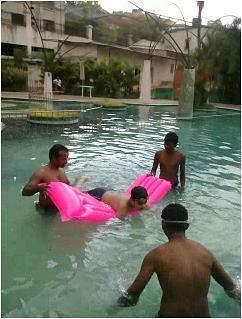 While going for swimming we had one more challenge of how to take the patient in the pool (transfer)? So for that I used my Ganpati Transfer method. We made the patient to sit on the thick towel, the towel acted like a sling where the patient was sitting in the centre of the sling. Then two people were holding the towel from the sides, this helped to lift the patient easily. After lifting the patient we made him sit at the edge of the swimming pool with his legs dangling in the pool. Then he was assisted to slide down in the pool so that he can stand in the pool. This was a very easy and safe transfer. Because patient had a poor balance he could not stand in the pool and poor control of Rt (hemiplegic side) he could not swim independently. So we made him lie-down on the Raft with his trunk on the raft. Which helped to control weight of the body and arms & legs were free to move. As he was able to move the normal upper and lower limb he started to stroking/swing them in the water which helped him to propel his body forward in water. 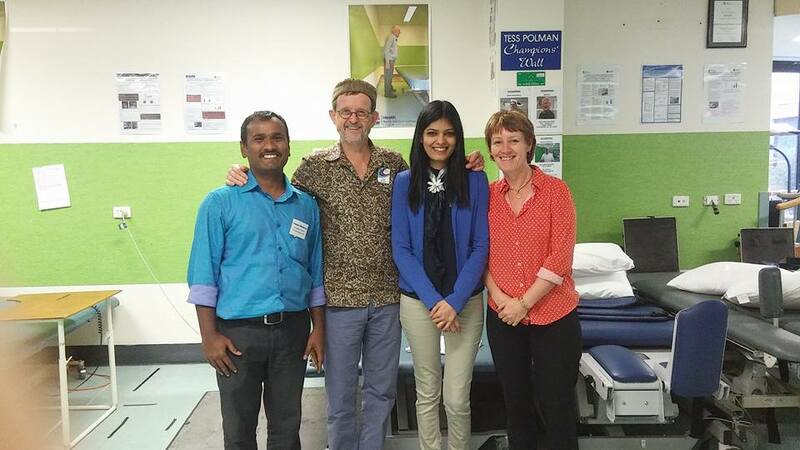 We were assisting the hemiplegic upper and lower limb for stroking/swinging. He was having lot of difficulty in walking steeping forward on ground, while doing assisted walking with AFO and Long knee Brace on Hemiplegic side. so we started training of assisted walking in water, with hand support. Because of the bouyancy his body weigth was reduced and he could stand in water with minimum assistance, this also helped in stepping forward the hemiplegic leg. It was very easy for him to walk in water with less support. We were Training him Assisted Walking on ground since 2 months but he could not step forward actively, but after training of walking in water for 1 months he could step forward on ground also with walker without assistance.